Brigadier General Lee W. Hopkins is the Director of the Joint Staff for the Louisiana National Guard. He serves as the chief advisor and principal assistant to The Adjutant General, State of Louisiana. He is responsible for directing, supervising, training, coordinating the staff and assisting The Adjutant General in the deployment and coordination of programs, policies, and plans affecting more than 11,000 members of the Louisiana National Guard. BG Hopkins is also designated as the state’s Dual Status Commander, responsible for commanding all military forces conducting emergency and contingency operations in Louisiana. BG Hopkins holds a Bachelor degree from Louisiana State University and a Master’s Degree in Strategic Studies from the United States Army War College. BG Hopkins was commissioned in 1986 through the State Officer Candidate School of the Louisiana Army National Guard. Prior to receiving his commission, BG Hopkins served as an enlisted member of the 205th Engineer Battalion in the Louisiana Army National Guard. 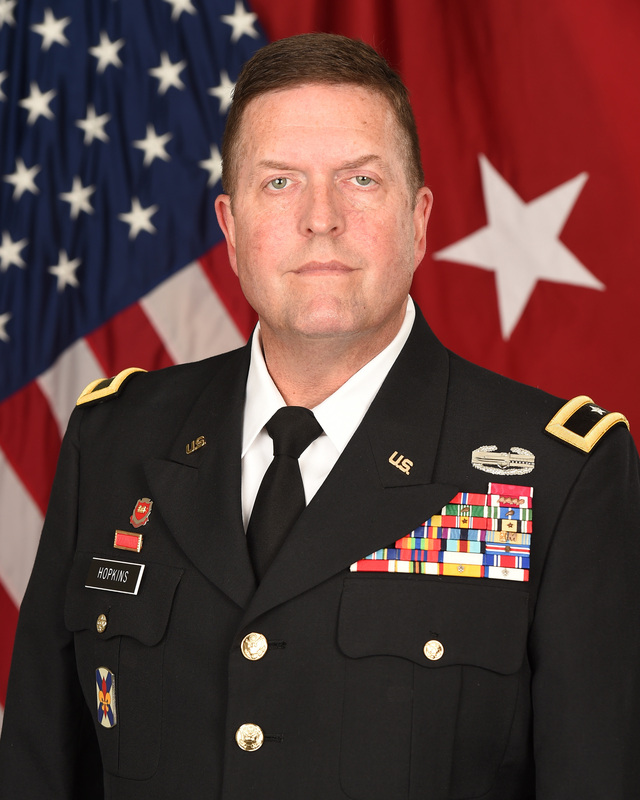 Following various leadership and staff assignments at the company and battalion level, BG Hopkins was selected to serve as the Battalion Commander of the 1088th Engineer Battalion in December 2003. BG Hopkins led the 1088th Engineer Battalion in Baghdad, Iraq during 2004-2005 in support of the 256th Infantry Brigade and Multi-national Division Baghdad. Upon his return from Operation Iraqi Freedom, BG Hopkins served as the Executive Officer for the 256th Infantry Brigade and the Deputy Commander of the 225th Engineer Brigade. Prior to his current assignment, BG Hopkins served as the Recruiting and Retention Commander, the Joint Director of Military Support, and the Director of Plans and Operations (J3/7) for the Louisiana National Guard. BG Hopkins’ military education includes the Engineer Officer Basic Course, Russian Basic Course, Military Intelligence Officer Advance Course, Combined Arms and Services Staff School, Command and General Staff College, and the United States Army War College. His awards, decorations, and honors include the Bronze Star, Meritorious Service Medal, Army Commendation Medal, Army Achievement Medal, Combat Action Badge, Army Reserve Component Achievement Medal, National Defense Service Medal, Iraq Campaign Medal, Global War on Terrorism Service Medal, Humanitarian Service Medal, Armed Forces Reserve Medal, Army Service Ribbon, U.S. Coast Guard Special Operations Ribbon, Army Reserve Component Overseas Training Ribbon, Louisiana Legion of Merit, Louisiana Cross of Merit, Louisiana Retention Ribbon, Louisiana War Cross, Louisiana Cold War Victory Ribbon, Louisiana Emergency Service Medal, and Louisiana Longevity Ribbon. BG Hopkins and his wife Lori reside in St. Francisville, Louisiana. They have two daughters, Ellen and Emma.